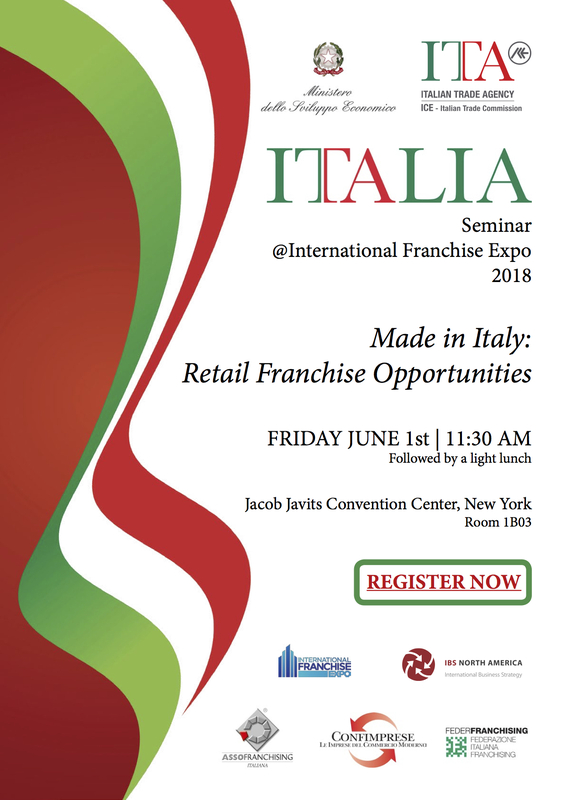 IBS North America will lead the Italian franchisors to the International Franchise Expo scheduled in New York from May 31st to June 2nd at the Jacob Javits Center. IFE is the largest franchise expo in United States and represents a great opportunity to deal with hundreds of international formats and meet thousands of investors from all over the world. Italy will exhibit for the second year at the International Franchise Expo. The franchise industry is growing very fast in Italy and many franchisors are looking to invest in the U.S. market through strategic partners. Discover the Made in Italy Retail Franchise Opportunities! 2018 Exhibitors: 101CAFFÈ, Bacio Nero, Dreamfood, Filicori Zecchini, Gruppo Europa, JU’STO, Natuzzi Italia, Phonup, Primadonna Collection, Queen’s Chips Amsterdam. For further information please contact a.pascarella@ibsna.us or call +1 212 377 2073 .